This tour supported the soundtrack to Tina Turner's semi-autobiographical film entitled "What's Love Got To Do With It". The tour primarily visited North America along with a few shows in Europe. “ As much as I try to break away from performing, here they are again, asking me to go hack on Top of The Pops .I became the first woman in rock n' roll to go out and sell out whole stadiums - and I'm proud of that; I'm proud that I sang to 160.000 people one night in Brazil. But what people don't know is that I got so nervous about touring. I got very upset about doing my last tour - at the start - and actually broke down crying. Of course, when you're out there and a crowd is going wild, you don't think about that. I know a lot of singers and stars find their fame overnight when they are barely much more than teenagers. But I had to work damn hard for over 30 years to get where I am today. So I don't mind making the effort. I'm still going to making the effort. In Hollywood, a lot of stars are thinking about retiring at my age, but I'm not packing up. No retirement place in the sun for me. I will still be working at something when I'm 90. 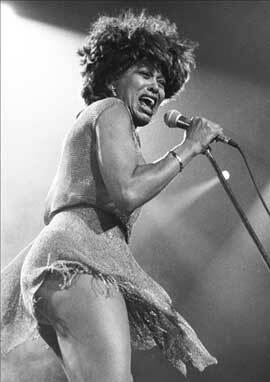 Tina Turner's last tour of North America was in 1987 during her Break Every Rule Tour. 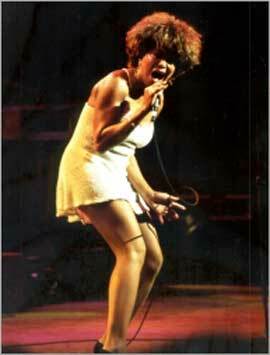 Tina Turner later confessed that she did not tour her previous record due to lack of sales in that region, as many spectators still had a hard time disconnecting her from The Revue. After numerous sold out performances at stadiums in Europe, Tina Turner wanted to do an intimate tour. The tour consisted of the same music and costumes of her previous set. Turner included new material from the soundtrack, along with different variations on her well-known hits. Originally destined as a North America only tour, Tina Turner decided to add a few dates in Europe (for summer music festivals) and - Australia (campaigning for the New South Wales Rugby League, as their anthem was "The Best"). * "Legs" was added to the setlist for performances starting in September 1993. The song was performed instead of "What You Get Is What You See". However, during shows in - Germany, "What You Get Is What You See" appeared in the setlist as normal. * During select shows in North America (specifically the New England region),Turner performed "Disco Inferno" instead of "What You Get Is What You See". * "Show Some Respect" was performed during the Australasia leg of the tour. The song was performed instead of "Legs". * During the performance at Radio City Music Hall in New York City (July 1993 - 17, 1993),Turner performed "I Might Have Been Queen". At the same show, Turner also performed "Shake a Tail Feather". * During the concert filming at the Blockbuster Pavilion in San Bernardino, California, Turner performed "Why Must We Wait Until Tonight" for promotional reasons. The song would not appear in the setlist until the performance at the Sydney Entertainment Centre in Sydney, New South Wales (Oct. 1993 - 20, 1993) for local television stations. The tour was chronicled at the Blockbuster Pavilion in San Bernardino, California. Released in September 1994, "What's Love: Live" included a special performance of "Why Must We Wait Until Tonight". Additionally, the concert was recorded in Sydney, New South Wales, - Australia at the Sydney Entertainment Centre as a special for local television. 6 June 1993 - Lawlor Events Center - Reno - USA - 11800 - S.O. 12 July 1993 - Radio City Music Hall - NYC - USA - 7000 - S.O. 13 July 1993 - Radio City Music Hall - NYC - USA - 7000 - S.O. 14 July 1993 - Radio City Music Hall - NYC - USA - 7000 - S.O. 16 July 1993 - Radio City Music Hall - NYC - USA - 7000 - S.O. 17 July 1993 - Radio City Music Hall - NYC - USA - 7000 - S.O. 19 Sept. 1993 - Greek Theatre - Los Angeles - USA - 6000 - S.O. 20 Sept. 1993 - Greek Theatre - Los Angeles - USA - 6000 - S.O. 21 Sept. 1993 - Greek Theatre - Los Angeles - USA - 6000 - S.O. 22 Sept. 1993 - Greek Theatre - Los Angeles - USA - 6000 - S.O. 23 Sept. 1993 - Greek Theatre - Los Angeles - USA - 6000 - S.O. 18 Oct. 1993 - Entertainment Centre - Sydney - Australia - 11500 - S.O. 19 Oct. 1993 - Entertainment Centre - Sydney - Australia - 11500 - S.O. 20 Oct. 1993 - Entertainment Centre - Sydney - Australia - 11500 - S.O.